For more than a century, visitors to The Spokesman-Review have watched copies of the newspaper roll off a printing press in downtown Spokane. That will change in late 2019 or early 2020, when the newspaper’s print publishing operations move to a Spokane Valley industrial park. “We’re one of the last publications in the country that still has a downtown printing site,” said Rick Sant, the newspaper’s director of operations. The move will occur as early as December, and it will allow Cowles Publishing to lease out valuable space in the production facility at 1 N. Monroe St. The newspaper’s print production will move to a building owned by Centennial Real Estate Investment in the 19200 block of East Euclid Avenue. Centennial is a subsidiary of Cowles Co., which also owns The Spokesman-Review. About 72 full- and part-time employees will be relocated with the move. 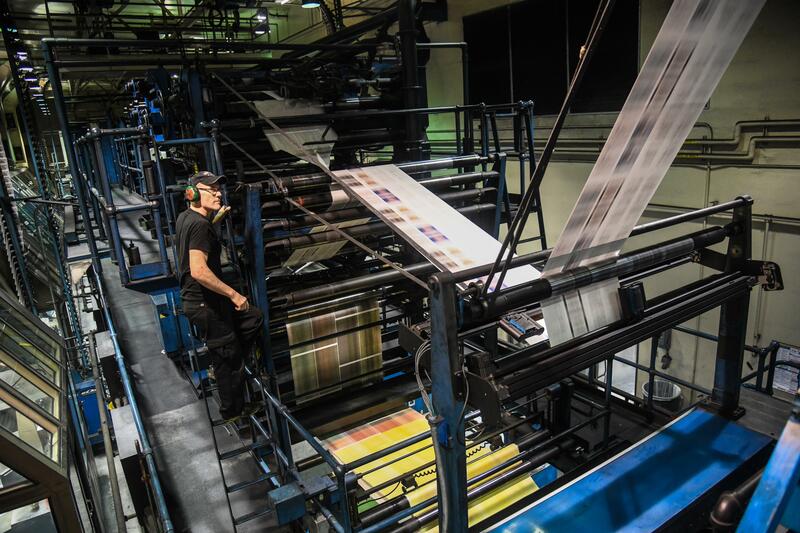 The move also involves the purchase of a smaller, more versatile printing press to expand the newspaper’s revenue from outside printing contracts. The Spokesman-Review’s current equipment is configured for newspaper broadsheets and press runs of up to 200,000 copies. “You could print the Los Angeles Times on that, it’s just that gigantic,” Sant said. The Spokesman-Review is negotiating to buy a press that can print smaller batches and tabloid-style publications. The new press will allow the paper to expand its commercial printing business, increasing revenue, Sant said. Both the move and the new press are designed to improve The Spokesman-Review’s bottom line, said Stacey Cowles, the newspaper’s publisher. “Because we aren’t printing 200,000 newspapers, we had a lot of downtime on the press,” Cowles said. Until the early 1980s, The Spokesman-Review was printed in the Chronicle building. Visitors could watch the two-story operation through a glass window. The press room was built with tile walls for ease of cleaning ink residue off the surface, Cowles said. Printing operations later moved across the street to the North Monroe facility. The building has about 168,000 square feet, including industrial space that could be converted into a brewery, restaurant or retail, Cowles said. Published: Feb. 7, 2019, 6:35 p.m. Updated: Feb. 8, 2019, 8:13 a.m.